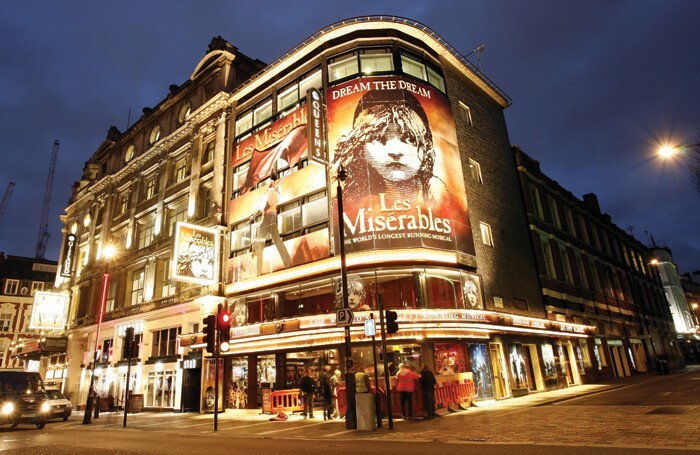 Les Miserables will move out of the Queen’s Theatre to another West End location in order to enable the venue, which has been its home for more than a decade, to undergo renovation. Delfont Mackintosh Theatres, which owns the Queen’s alongside seven other West End venues, has announced the works as part of a wider programme of improvements to its theatres. It is centred on strengthening and extending the life of the plasterwork ceilings in its theatres, in order to enable another 100 years of operation. Cameron Mackintosh said carrying out the programme of works would have “major financial consequences”, running into “many millions of pounds”, but said it was necessary to ensure the theatres’ futures. The Queen’s is the only theatre where programming will be interrupted by renovation works, Delfont Mackintosh said, because Les Miserables looks set to continue its run for “many years to come”. The theatre, which has had little refurbishment since it reopened in 1959 following bomb damage from the Second World War, needs major renovation backstage and will also close to allow elements of the original Edwardian auditorium, such as the boxes, to be restored. Other facilities will also be improved in the process. This will take place in 2019/20, and the company said plans are being finalised to allow Les Miserables to continue its run elsewhere for the duration. Arrangements will be announced in the autumn. Four of the five playhouses in Delfont Mackintosh’s collection, all of which were designed by theatre architect William Sprague, will need to close for two to four months over the next three years. The first to undergo improvement works will be Wyndham’s, starting next month, followed by the Noel Coward and the Gielgud in 2019 and then the Queen’s. At the Novello, more than half of the required work has been done and can be completed without closing the venue. The Prince of Wales, home to The Book of Mormon, and the Prince Edward, where Aladdin is playing, do not need immediate works and will be dealt with at a later date once both musicals have competed their runs. Meanwhile, the renovation of the Victoria Palace, for Hamilton, is already complete. Cameron Mackintosh said: “Having just completed the hugely rewarding but very expensive restoration of the Victoria Palace, news of the timing of these works which are necessary to ensure my other theatres are in tip top condition for actors, producers and audiences, long after the final curtain has dropped on me, was not the most welcome.